Never fit your wedding dress before the wedding, or else it wouldn't happen, the old pamahiin goes. But Divine Lee had a totally different reason for not trying on her gold bridal gown. Divine tied the knot with businessman Blake Go on Saturday, August 5, at the Cebu Metropolitan Cathedral on Mabini Street in Cebu City. 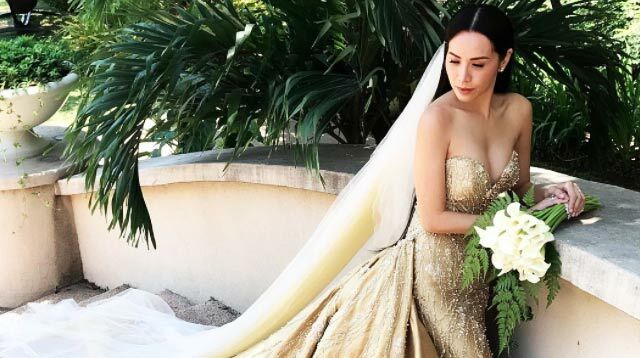 Having been a suki and good friend of designer Rajo Laurel, the socialite didn't see the need to do multiple fittings while they were planning her dress. "I refused to fit kasi, hello, memorized na naman ni @rajolaurel size ko," she said in an Instagram post. "Kaya they call me #BriDEADMA. I only tried it once and everything was perfect." Although white has been the traditional color for wedding gowns, Divine took a risk and "decided to go for gold." Because she's worn white wedding dresses to events, she probably wanted something different for her own wedding. Even Mr. Laurel himself seemed more than pleased with how the dress turned out—nothing less than ~divine~. "My DIVINE Bride! Because in my heart & mind she will always be golden," the designer wrote. Well, it turns out that being chill AF (and having a designer you really trust) pays off. Do you think you can pull off a gold wedding dress when your big day comes? Is there any other unusual color you'd want for your wedding dress? Tell us in the comments section below!